When one thinks of Venice, images of gondolas and canals, Piazza San Marco, and perhaps Carnevale come to mind. Certainly, these have been the most photographed icons of this unique tourist destination. But, what about something that’s off the beaten path? This summer, my family visited Venice and, at the recommendation of our b&b owner, stopped at the Mercato di Rialto. Just off the Rialto bridge along the Grand Canal, this market is a favorite of locals, where one can find fresh, gorgeous fruits — the sweetest cantaloupe I have tasted — vegetables in all shapes and sizes, and all kinds of seafood in the Pescheria (fish market). 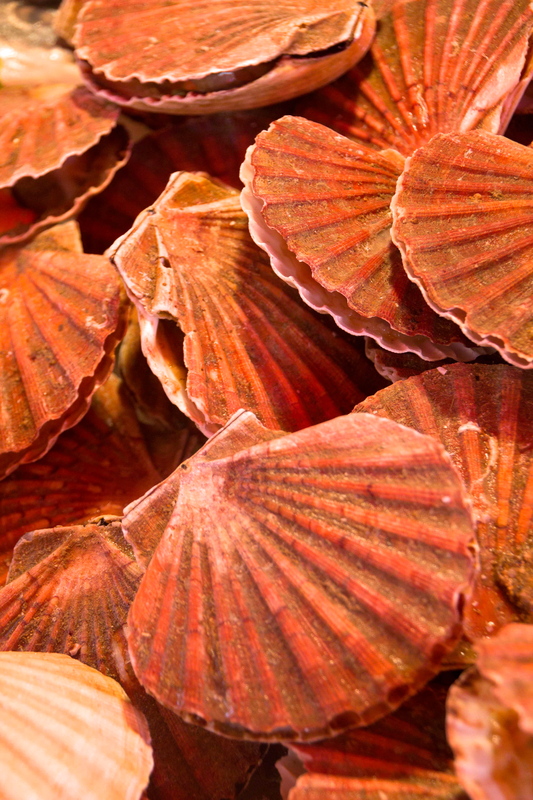 Exotic fish, giant octopus, slimy squid, and these colorful, shapely scallops, called cappesante. Just beautiful! I’ve bought scallops before, but just the white meat. I don’t remember ever seeing the actual shells. When you’re tired of being jostled by the crowds in all the usual tourist spots, a stroll through the Mercato will give you a glimpse into the unhurried and tasteful lives of Venetians.